High blood pressure is one of the most important risk factors, directly responsible for increasing the cardiovascular morbidity and mortality. The primary objective was to evaluate the efficacy of metoprolol XL/chlorthalidone against metoprolol XL/hydrochlorothiazide with respect to mean fall in systolic and diastolic blood pressure. The secondary objective was to compare the response rates and to evaluate the tolerability of study medications in patients with mild-tomoderate essential hypertension. Total 130 eligible patients (65: metoprolol XL 25 mg/chlorthalidone 6.25 mg; 65: metoprolol XL 25 mg/HCTZ 12.5 mg) were enrolled in this randomized, comparative, multicentric, 12-weeks study. Sixty-two patients from each group completed the study. After 4-weeks of treatment, non-responders from chlorthalidone 6.25 mg combination group were shifted to metoprolol XL 50 mg/chlorthalidone 12.5 mg and non-responders from HCTZ 12.5 mg combination group were escalated to metoprolol XL 50 mg/HCTZ 12.5 mg. The study treatment groups were comparable with respect to demography and baseline disease characteristics. Both the starting therapies were comparable with respect to mean fall in SBP (p = 0.788) and DBP (p = 0.939), and response rates (p = 1.0) after 4-weeks of therapy. Also both the step-up therapies showed similar mean fall in SBP (p = 0.277) and DBP (p = 0.507) at the end of 12-weeks. However, significantly more number of patients from chlorthalidone 12.5 mg/metoprolol XL 50 mg group responded to therapy as compared to that from HCTZ 12.5 mg/metoprolol XL 50 mg group (p = 0.045). All the reported adverse events were of mild-to-moderate intensity. There were no clinically significant trends in electrolytes (Na+, K+, Cl-)and fasting blood sugar, evident across the treatment groups. Chlorthalidone in combination with metoprolol XL is as effective and well tolerated as widely used combination of metoprolol XL/HCTZ, thus providing an alternative therapeutic option. Hypertension is a potent risk factor for all major cardiovascular events . It has been predicted that by the year 2020 there will be an increase of almost 75% in global cardiovascular disease burden. Of a number of risk factors that have proven to be directly responsible for the increase in cardiovascular morbidity and mortality, high blood pressure is one of the most important and independent risk factor, affecting 24-36% of the adult population in developed countries . Epidemiologic studies have established a strong linear relation between blood pressure and cardiovascular disease and randomized trials have documented that blood pressure reductions by antihypertensive drugs confer cardiovascular protection . Evidence from the major clinical trials and other pivotal hypertension studies has established that thiazide type diuretics confer significant reduction in stroke and cardiovascular events [4–10]. Given their strong record of evidence, low cost and favorable tolerability; low dose thiazide - like diuretics are recommended as initial therapy in most of the hypertensive patients and are the foundation for multiple antihypertensive drug regimens, according to the Seventh Report of the Joint National Committee on Detection, Evaluation and Treatment of high blood pressure (JNC 7 Report) . These pivotal studies primarily used chlorthalidone as initial therapy believing longer duration of action. The results of these studies reported consistently more reduction in cardiovascular events than the studies that primarily used hydrochlorothiazide (HCTZ) . The results of a trial conducted by Ernst ME et al., demonstrated that higher potency of chlorthalidone resulted in longer duration of action that provided night time blood pressure control and hence was effective in providing additional protection from stroke and myocardial infarction during early morning blood pressure surge . Since chlorthalidone appeared to be more than twice as potent as hydrochlorothiazide, a low dose of chlorthalidone i.e. 6.25 mg once daily was thought to be adequate in providing blood pressure control similar to low dose of other approved drugs and at the same time would reduce the metabolic adverse effects . More than two-thirds of hypertensive individuals cannot be controlled on one drug and will require two or more antihypertensive agents selected from different drug classes [14–18]. JNC 7 Report as well as the European Society of Hypertension and Cardiology (ESH/ESC) and the German Hypertension League has stated that large proportion of hypertensives will require a combination of two or more antihypertensive agents to achieve the desired target blood pressure (BP) [11, 19, 20]. Blood pressure reduction achieved with beta-blocker and diuretics is the best recorded intervention to date for prevention of cardiovascular morbidity and death in patients with hypertension . A significant reduction in the incidence of stroke (38%), coronary artery disease (16%), and cardiovascular mortality (21%) was achieved with blood pressure lowering of average 9-10/5-6 mmHg over 5 years by use of diuretics and beta-blockers . It has been reported that combination of metoprolol and chlorthalidone is effective than chlorthalidone alone and well tolerated in mild-to-moderate hypertension [22, 23]. Data from published literature have reported mixed responses when it comes to 24 hours BP control by conventional metoprolol when administered once daily. Hence an extended release formulation of metoprolol was developed to have 24 hour BP control and better patient compliance. Keeping in view this background and to reduce the metabolic adverse effects and electrolyte imbalance associated with thiazide diuretics, we decided to evaluate the efficacy and tolerability of low dose of chlorthalidone i.e. 6.25 mg in combination with extended release metoprolol succinate (Metoprolol XL) administered once daily in comparison with a fixed dose combination of extended release metoprolol succinate and HCTZ 12.5 mg/day in patients with mildto-moderate essential hypertension. The primary objective was to compare the mean fall in systolic blood pressure (SBP) and diastolic blood pressure (DBP) between metoprolol XL/chlorthalidone and metoprolol XL/hydrochlorothiazide combination in patients diagnosed of stage I/stage II (As per JNC 7 criteria for hypertension) essential hypertension. The secondary objective was to evaluate the number of responders in each treatment group and to evaluate the tolerability of study treatments in these patients. Male and female patients with age 18 years and above were eligible if; they were diagnosed of essential hypertension as per JNC 7 criteria, were willing to sign informed consent form and were ready for regular follow up. Patients with DBP > 109 mmHg were excluded from the study. Patients with secondary hypertension, anuria and known history of hypersensitivity to chlorthalidone, metoprolol, hydrochlorothiazide or any other similar drugs of same chemical class or any other component of the formulations were excluded from the study. Patients with recent cardiovascular accident or myocardial infraction, stroke or has undergone coronary artery bypass surgery or transient ischemic attack in past 6 months, patients with congestive heart failure, angina requiring more than short acting nitrates, arrhythmias requiring treatment, significant valvular disease, renal artery stenosis, overt heart failure, AV block greater than first degree, sinus bradycardia, severe aortic stenosis, respiratory bronchial asthma, severe renal failure (creatinine clearance < 30 ml/min), hepatic encephalopathy or severe impairment of liver function (SGOT/SGPT > 2.5 times the upper limit of the normal laboratory value), history of gout, patients with serum sodium < 135 or > 145 mmol/l, serum potassium < 3.3 or > 5.3 mmol/l were excluded from this study. Patients with untreated Addison's disease, concomitant lithium therapy, cardiogenic shock, sick sinus syndrome and peripheral arterial disease were excluded. Pregnant and lactating women and females of childbearing potential not practicing contraception were not enrolled in this study. This was a randomized, comparative, open label study, conducted at LTMM College and LTMG Hospital, Mumbai; Indira Gandhi Medical College and Mayo Hospital, Nagpur and Seth GS Medical College and KEM Hospital, Mumbai. The study was approved by hospital ethics committee of each center. All patients were provided an oral explanation about the nature of the study and about study drugs by the investigator at each center. An information sheet was provided in a language understood by the patient, and written informed consent was obtained from each participant prior to any study-related procedure. The execution and monitoring of the study was done in accordance with the requirements of good clinical practice. This randomized, comparative, parallel group study consisted of screening visit followed by baseline visit 48 hours post screening. 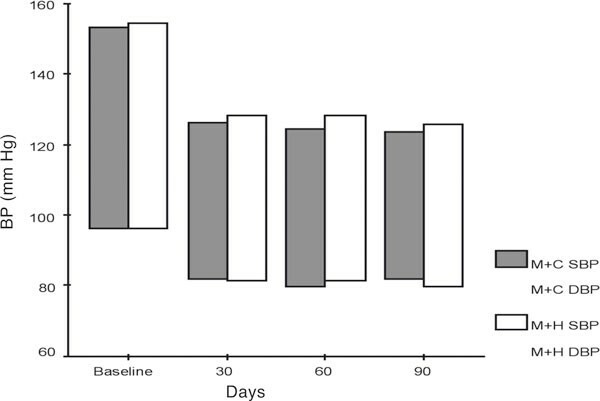 All enrolled patients received 7-days placebo washout period. This was followed by 3 months of active treatment phase. Eligible patients were randomized to receive metoprolol XL 25 mg/chlorthalidone 6.25 mg or metoprolol XL 25 mg/hydrochlorothiazide 12.5 mg. The study drugs were administered orally once daily in morning. Compliance of the patients to study medication was assessed based on the patient diary at each study visit. Randomization chart was provided to each center by the sponsor. After the baseline visit, patients were examined for safety and efficacy outcomes on day 15, day 30, day 60 and day 90. At each visit, patient's blood pressure was measured in morning prior to taking medications. During the treatment phase, non-responders from metoprolol XL 25 mg/chlorthalidone 6.25 mg were shifted to metoprolol XL 50 mg/chlorthalidone 12.5 mg, similarly non-responders from metoprolol XL 25 mg/hydrochlorothiazide 12.5 mg were shifted to metoprolol XL 50 mg/hydrochlorothiazide 12.5 mg. The responders from each therapy continued on the same therapy for total duration of three months. Efficacy of the therapy in treated patients was evaluated by BP measurement at each study visit throughout study period. Blood pressure was measured by auscultatory method. Measurements were performed after 10 minutes rest in duplicate separated by 2 minutes and then average was taken. If the first two readings of DBP differed by more than 5 mmHg, additional reading was obtained and average of two closest reading was taken. The study investigator at each site performed all the BP measurements throughout the study period and the same method was followed at all study sites for BP measurement. Patients were termed as responder if their BP was controlled (SBP < 140 mm Hg and DBP < 90 mm Hg). Patients who received at least one dose of the study medication were evaluable for safety assessment. Blood samples were obtained at baseline and at the end of three months therapy or at the last follow-up visit for early termination/withdrawal cases to perform hematology and biochemistry tests including CBC, urine routine, ECG, platelet count, WBC count, differential count, ALT, AST, alkaline phosphatase, bilirubin, albumin total proteins, serum creatinine, BUN, uric acid, serum electrolytes (Na+, K+), random blood glucose and lipid profile (TG, TC, LDL, HDL). Safety evaluation was also based on the adverse events (AE) reported during the study. AEs were categorized by the investigator based on their intensity as mild, moderate or severe and the relationship to the study drug as none, probably not, possible, probable or definite. At every visit during the entire study period, the reported AEs, clinical state of the patients and details of concomitant medication if any were captured. The primary objective for assessing efficacy was to compare the mean fall in SBP and DBP between treatment groups. The sample size calculation required approximately 148 patients to be randomized and 124 evaluable patients (62 patients per treatment group) to complete the study to detect a treatment difference of at least 3 mmHg in the primary comparison with a power of 80% at 5% level of significance (two sided). Basic descriptive statistics were calculated. The two treatment groups were similar with respect to demographic characteristics. For data analysis the whole population was divided into two subgroups, escalated patients and non-escalated patients. Non-escalated patients include patients who received the baseline therapy up to 1 month and remained controlled on the same therapy to the end of the study. While escalated patients include patients continued on the baseline therapy up to 1 month but escalated to respective step up therapies due to poor or no response to the baseline therapies. Out of total 130 patients enrolled in the study, 65 patients were randomized to metoprolol XL/chlorthalidone combination and 65 were randomized to metoprolol XL/hydrochlorothiazide combination. Efficacy was evaluated in 124 patients. At the end of 4 weeks of therapy, 64 patients (metoprolol XL 25 mg/chlorthalidone 6.25 mg: 32 patients; metoprolol XL 25 mg/HCTZ 12.5 mg: 32 patients) responded to the therapy (SBP < 140 mmHg and DBP < 90 mmHg) (Refer Table 2). Both the treatments showed significant fall in SBP and DBP from baseline (p < 0.001) and were similar with respect to mean fall in BP and response rate (p > 0.05). Responders from both the treatment groups remained controlled till the end of therapy (day 90). Graph 1 shows fall in mean SBP and DBP for responders on both the starting therapies. Mean BP for responders at the end of 4 weeks of therapy on metoprolol XL 25 mg + chlorthalidone 6.25 mg and metoprolol XL 25 mg + HCTZ 12.5 mg. C: Chlorthalidone, H: Hydrochlorothiazide, M: Metoprolol XL, * The upper end of the bar indicates value of SBP and lower end of the bar indicates value of DBP. Remaining 60 patients (30 in each group) who were uncontrolled on starting therapies were shifted to respective step-up therapies to receive metoprolol XL 50 mg/chlorthalidone 12.5 mg and metoprolol XL 50 mg/HCTZ 12.5 mg. At the end of 12 weeks of therapy, there were significantly more number of responders (SBP < 140 mmHg and DBP < 90 mmHg) in chlorthalidone combination group (25/30, 83.33%) as compared to that from HCTZ combination group (18/30, 60%) (p = 0.045). Both the treatments were comparable with respect to mean fall in SBP and DBP at the end of therapy (Refer Table 3). At the end of three months, total 15 patients from chlorthalidone combination group and 10 patients from HCTZ combination group achieved BP normalization (BP < 120/80 mmHg). In both the treatment groups the mean fall in BP was maximum in first four weeks and subsequently the fall was maintained till the end of three months (Refer Graph 2). Mean fall in BP for 124 patients over 3 months. M: Metoprolol XL, C: Chlorthalidone, HCTZ: Hydrochlorothiazide. Use of concomitant medications was recorded during the entire study period. The commonly used concomitant medications were antidiabetics, vitamin supplements, proton pump inhibitors, statins, antibiotics and antianginal. Safety evaluation was carried out in patients who had received at least one dose of the study medication. Clinical and laboratory AEs are summarized in Table 4. The percentage of patients reporting AEs were generally similar on both the treatment groups. Total 50 AEs occurred during the trial. Some patients reported more than one AE. None of the patients reported serious adverse event (SAE). Commonly reported AEs were giddiness, headache, fatigue and GERD. In the investigator's judgment, the reported AEs were of mild to moderate intensity, and possibly related to the study drugs. Some of the AEs subsided on its own and some of the AEs like GERD, numbness, tingling required symptomatic treatment. The laboratory evaluations were done at baseline and at the end of therapy. Mean changes from baseline for various laboratory parameters were evaluated at the end of 3 months for all the patients. There were no clinically significant trends evident across the treatment groups (Refer Table 5) at the end of study. Changes in serum electrolytes and blood glucose levels were clinically unremarkable across the therapy groups. There was no serious laboratory abnormality reported in any patient in this study. However, TG level in 3 patients (2 on chlorthalidone combination group and 1 on HCTZ combination group) were elevated and were prescribed statin therapy. This study examined the antihypertensive efficacy of 12-week treatment with fixed-dose combination of metoprolol XL/chlorthalidone in Indian patients with essential hypertension. This is probably the first study that compared the safety and efficacy of low dose chlorthalidone 6.25 mg with hydrochlorothiazide 12.5 mg both when used in combination with metoprolol XL in patients with essential hypertension. The low dose chlorthalidone combination used in this study was not only effective in reducing blood pressure but also showed good tolerability without any metabolic AEs. In earlier study, metoprolol was combined with chlorthalidone in doses as high as 4-8 times the doses that are used in this study and showed good efficacy and tolerability . Data form this study reported significantly greater fall with slow release metoprolol/chlorthalidone than metoprolol alone. It was thus concluded that addition of diuretics like chlorthalidone greatly enhances the antihypertensive efficacy of metoprolol. Thiazide and thiazide-like diuretics have shown good efficacy as well as long term benefits in terms of morbidity and mortality in hypertensive patients. Available literature indicates that chlorthalidone is twice as potent as hydrochlorothiazide . Hence, we propose that the low dose of chlorthalidone should be 6.25 mg instead of commonly prescribed 12.5 mg unlike that of HCTZ. Chlorthalidone at such a small dose of 6.25 mg may further reduce the chances of metabolic adverse effects which are a well known class effects of diuretics. In this study, we have demonstrated that antihypertensive therapy with chlorthalidone 6.25 mg is as good as HCTZ 12.5 mg, both when used in combination with metoprolol XL 25 mg. Both the starting therapies showed comparable mean fall in BP (SBP: p = 0.788, DBP: p = 0.939) and response rates (p = 1.0). Similarly both the step up therapies were similar with respect to mean fall in BP(SBP: p = 0.277, DBP: p = 0.507) at the end of therapy, however significantly more number of patients from chlorthalidone combination group achieved goal BP as compared to those from HCTZ combination group (83.33% vs 60.0%, p = 0.045). 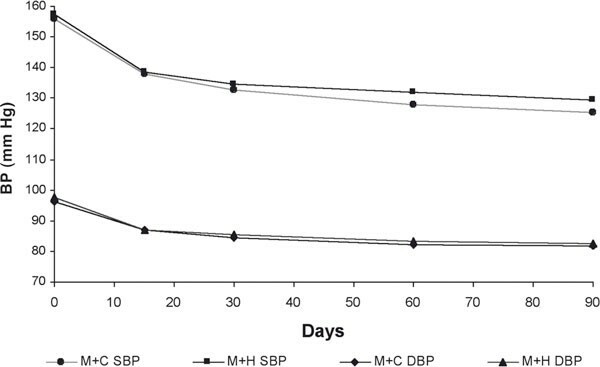 Our study reported a fall of -27/-14 mmHg in SBP/ DBP after 4 weeks of therapy with metoprolol XL 25 mg/chlorthalidone 6.25 mg, confirming efficacy of this combination. This fall was similar to that reported in literature (-31/-17) but this was achieved with metoprolol 200 mg/chlorthalidone 25 mg . One of the major reasons for low usage of chlorthalidone in clinical practice is concern regarding adverse metabolic effects such as hypokalemia, hyponatremia, hyperuricemia and impaired glucose tolerance. The AEs reported in literature for chlorthalidone were at a dose of 12.5 mg - 25 mg/day . We had used chlorthalidone at a dose of 6.25 mg/day as a starting therapy. Data from our study did not report any clinically significant metabolic AEs which is line with the previous studies that have used chlorthalidone 6.25 mg in combination with other antihypertensive agents [25, 26]. The commonly reported AEs on both the study arms were of mild to moderate intensity and were similar to that reported in literature for individual components of the combination. The results of the present study confirmed the efficacy and safety of low dose chlorthalidone combinations in patients with essential hypertension. The strong record of evidence, low cost and favorable tolerability profile makes low dose chlorthalidone and its combinations a useful therapeutic option for treating patients with essential hypertension. As this was an outpatient study, no ambulatory blood pressure monitoring was done. Also due to short term nature of the study, we could not assess the effect blood pressure reduction on cardiovascular morbidity and mortality. The results of this study demonstrated that beta-blocker like metoprolol XL with thiazide-like diuretic; chlorthalidone is as effective and well tolerated as widely used combination of metoprolol XL/HCTZ, thus providing an alternative therapeutic option for treatment of patients with mild to moderate essential hypertension. Authors, Dr. Anil Pareek and Mr. Nitin Chandurkar are employees of Ipca Laboratories Limited, who sponsored this trial. Authors, Dr. S. D. Zawar, Dr. Santosh Salagre and Dr. Niteen Karnik were the study investigators and did not receive any financial benefits and declare that they have no conflict of interests of declarable nature. Acknowledgment: This study was sponsored by Ipca Laboratories Limited, Mumbai, India. The authors would like to thank Ms. Shruti Kulkarni for technical assistance right from the inception of the study and Mr. Mitesh Sharma, biostatistician for statistical analysis and data management for this study. Dr. Anil Pareek and Mr. Nitin Chandurkar, who are associated with Ipca Laboratories Ltd, were involved in the conceptualization, coordination and execution of the study, at all centres.